The default Windows 10 web browser is Microsoft Edge. Microsoft touts it as being a faster and safer browser for getting things done on the web. Based on a report from NSS Labs, Edge is safer than Firefox and Chrome browsers at protecting you from certain online threats. Edge is also faster than Firefox and Chrome according to the Apple Jetstream 1.1 benchmark. Although faster and safer than some other web browsers, Microsoft Edge may suffer from the same problems as any other app. Perhaps it won’t open at all, or it opens for a moment then crashes. If so, Windows 10 offers some options to fix Microsoft Edge if it stops working properly. Try the fixes below to get Edge working again. Sometimes clearing your browser’s cache of temporary files can fix certain page loading issues. 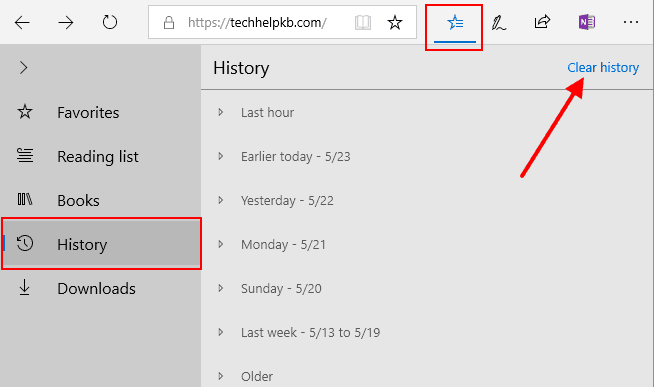 In Edge, click the Hub icon > History > Clear history. 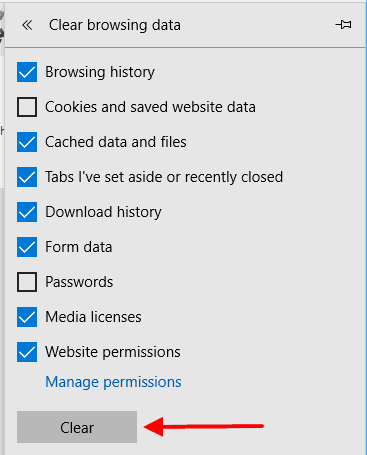 In the Clear browsing data panel, check the boxes you want to clear, then click the Clear button. Close and relaunch Edge to see if clearing the cache fixed the problem. If clearing the cache did not do the trick, try repairing Microsoft Edge. When you use the repair utility, it won’t affect Edge’s data. To try a repair, click Settings > Apps > Apps & features. Scroll down to Microsoft Edge and click Advanced options. In the Microsoft Edge panel, scroll down to the Reset section. Click the Repair button. Edge will close, and relaunch as part of the repair process. Check to see if repairing Edge fixed the problem. 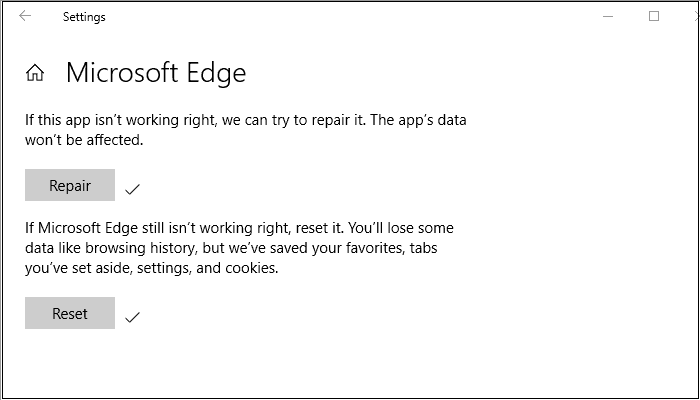 If neither clearing the cache nor repairing Microsoft Edge fixed the problem, try resetting it. Note that if you decide to reset Edge, you will permanently lose Edge’s data like browsing history, extension data, pinned tabs, preferences and sign-in details. Saved are other settings, like bookmarks/favorites, passwords, cookies, set-aside tabs, reading list, and top sites. To try a reset, click Settings > Apps > Apps & features. Scroll down to Microsoft Edge and click Advanced options. In the Microsoft Edge panel, scroll down to the Reset section. This time, click the Reset button, then click the Reset button again. Edge will close as part of the reset process. 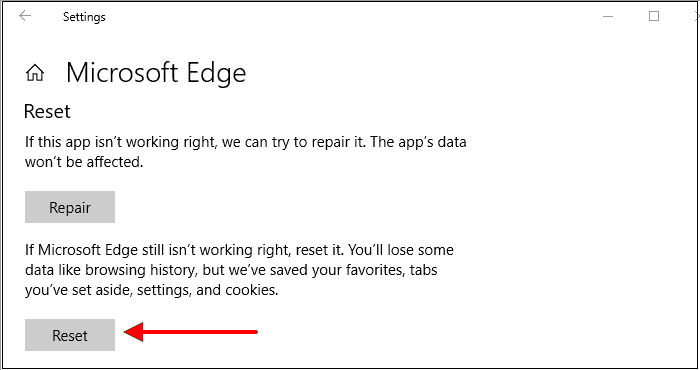 Relaunch Edge to see if resetting it fixed the problem. Thank you for visiting Tech Help Knowledgebase to learn how to fix Microsoft Edge if it stops working.